The Cincinnati Bengals have selected The Motz Group along with turf manufacturing partner Shaw Sports Turf, to deliver a premium synthetic turf system that is ideal for high caliber athletes to their home, Paul Brown Stadium. In addition, this project will allow Motz to deliver all sports surfacing needs to the Bengals, including the high-performance natural turf renovations on their training facility also taking place this summer. The Motz Group will be equipping Paul Brown Stadium with a top-of-the-line synthetic turf system that will be ready for the 2018 season, featuring a new end zone design. Manufactured by Shaw Sports Turf, this product includes Strenexe XD slit-film fibers that are supported by the strongest synthetic turf backing in the industry, UltraLoc. Ideal for its mix of durability and performance, this system’s interlaced structure provides the type of sturdy and reliable playing surface expected by professional athletes. Shaw Sports Turf is proven in NFL and other high-profile fields, with over 3,000 successful installations in North America. “With Shaw Sports Turf’s reputation as one of the leading manufacturers of synthetic turf playing surfaces that are geared for high-level performance, and The Motz Group’s long lasting legacy of not just building fields, but building futures, you get the best of both worlds,” said Chuck McClurg, Vice President of Shaw Sports Turf. 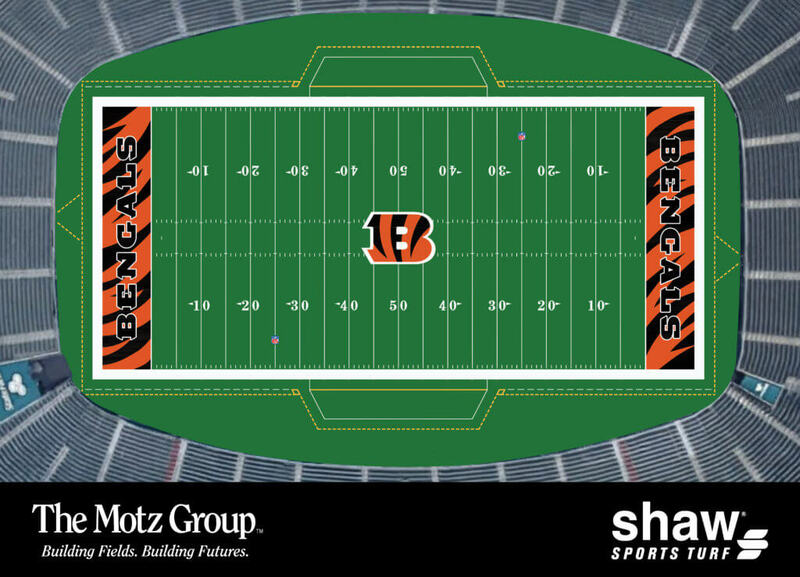 The Motz Group will begin construction for the Cincinnati Bengals’ new synthetic turf field today, April 30. The Bengals will be in good company, joining other Motz professional sports clients like the Atlanta Braves, Baltimore Ravens, and Cincinnati Reds. “The Motz Group is excited to partner with the Cincinnati Bengals and Hamilton County. We are committed to delivering a high-quality synthetic turf field with our in-house installation teams, while providing our industry-leading service and maintenance support throughout the life of the field. Though our presence is global, our roots are here in Cincinnati. We are honored to work with our hometown team, the Cincinnati Bengals,” said Zach Burns, President of The Motz Group. A wholly-owned subsidiary of Berkshire Hathaway Inc., Shaw Industries is a full flooring provider to the residential and commercial markets. Shaw supplies carpet, hardwood, laminate, resilient, and tile/ stone flooring products, as well as synthetic turf. Shaw Sports Turf is the largest American-owned and American-made synthetic turf companies in the world and has represented quality and innovation for over 50 years with over 3,000 successful installations, and an impressive list of high-profile field installations including the Baltimore Ravens, Tampa Bay Rays and Cleveland Browns. For more information, please visit www.shawsportsturf.com or call 866-703-4004. The Motz Group has been building world-class sports fields both nationally and internationally for over 40 years. They’ve earned their global reputation with trailblazing innovation and an uncompromised commitment to quality. Motz specializes in high-performance natural and synthetic sports field design, construction, removal, replacement, maintenance and management. Athletes have competed on Motz’s surfaces in the NFL, MLB, NCAA, Olympics and even the World Cup. Their globally recognized products include the world-renowned hybrid turf system, Eclipse® and the comprehensive natural grass root zone management system, AirPAT®, as well as a line of pro-grade synthetic turf products. For more information, please visit www.themotzgroup.com or call 800-871-3992.